When Jack Roush, an avid aviator, took it upon himself to improve the P51 Mustang engine to increase its service time between rebuild, he did it by examining every piece and part in the engine, paying meticulous attention to detail. He looked at how every part in the engine interacted and found improvements and efficiencies that the factory never considered. His work took the interval between rebuild for these engines from 200 hours to more than 1000. This level of detail and industry-leading engineering knowledge has pervaded all of Roush’s endeavors and enabled a small engineering services business to grow into a global, multifaceted engineering, production, and research and development powerhouse, where the impossible is made possible for customers every day. Located just outside the resurgent center of American manufacturing in Livonia, Mich., Roush Industries handles work for customers located around the world and right around the corner. In processing external orders from the automotive, oil and gas, recreational and aerospace markets to Roush Enterprises’ own internal manufacturing needs, it’s easy to see the wide variety of work that comes through operation manager Mel Koslowski’s door. Koslowski brought a wealth of machining and production knowledge gained over a wide-ranging career to Roush Industries when he joined the company in 2009. 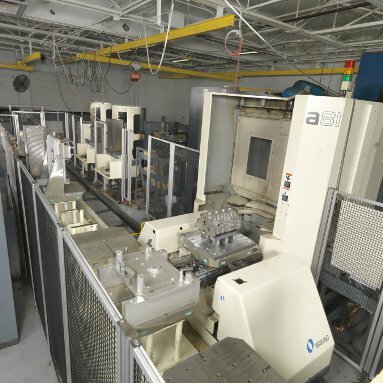 Based on prior experience with Makino technologies, he was immediately pleased with the machining technologies at his disposal, particularly four Makino a81 horizontals, three of which were tied within a 20-pallet Makino Machining Complex (MMC) automated material-handling system. Koslowski understood the capabilities afforded by the equipment, and he aimed to maximize their utilization. And it turns out that is exactly what he’d need to do, every day. “While other shops might push a machine to its absolute limit every once in a while or see something really difficult done at a demo day, Roush is doing that on our Makino equipment every single day,” states Koslowski with a measure of pride. 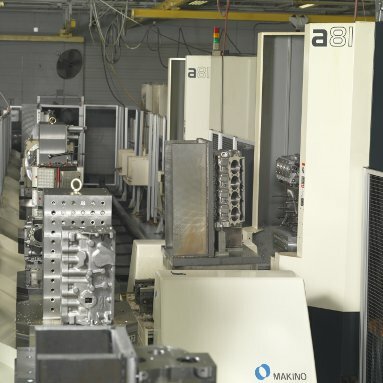 The company has four Makino a81 horizontals, three of which are tied within a 20-pallet Makino Machining Complex (MMC) automated material-handling system. Roush’s MMC investment has helped the company improve the workflow and profitability of its high-mix, low-volume production needs, allowing operators to pull up orders quickly with minimal disruption to the company’s overall product flow. It became immediately clear to Koslowski that Roush’s production demands were unlike any other production facility that he’d previously managed. “The shop that I came from was a traditional part production operation, where you’d set something up and run it for thousands of pieces for days. Here at Roush, it’s all about low-volume batch runs, spot buys and custom machining,” he says. One of Koslowski’s early goals was to establish higher expectations for shop cleanliness and organization at all times, not just prior to customer tours. The justification for this goal was to ensure that Roush maintains a completely nimble and flexible production environment that can quickly adapt to changing part volumes on a daily basis. Similar to the urgency and immediacy required when customers plan a visit, so too could the shop react to changes in production orders. With the combined variety of applications arriving from internal and external orders, this same level of speed and versatility is required from Roush’s flexible manufacturing systems. To illustrate, a machine might be gundrilling 316 stainless steel in one instance, but then switch to boring a compacted graphite iron Ford Racing NASCAR engine block within a matter of minutes. Troy Carney, the program manager at Roush Industries and Koslowski’s right-hand man, also attributes much of this flexibility to the cell’s sizable pallet stock and large-capacity tool magazines found in each machine. 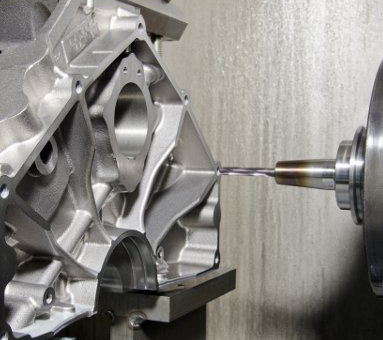 A machine might be gundrilling 316 stainless steel in one instance, but then switch to boring a compacted graphite iron Ford Racing NASCAR engine block within a matter of minutes. Adjacent to the MMC cell is the company’s fourth a81. This stand-alone machine operates in conjunction with the cell, adding more flexibility to the workflow in situations where orders could disrupt optimal product flow within the cell. 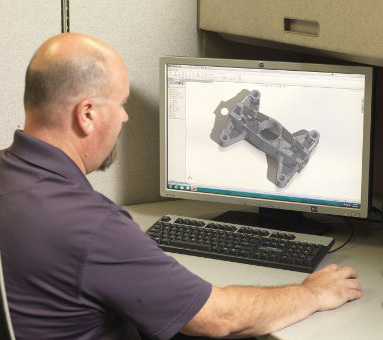 Most often, this occurs when extended machining processes are required in order to complete a part, or there are processes that require unique setups not readily available within the current pallet fixtures. By operating within this configuration, Roush is able to increase machine availability within the cell for orders that are best managed through automation. What matters most to Roush Industries is its people, so it bothers operations manager Mel Koslowski that in five to 10 years manufacturers are expected to experience a true crisis in the availability of skilled machinists. It is especially worrisome as the seasoned veterans who are currently leading companies begin to consider retirement. Koslowski says that he has been to community colleges with impressive machine setups and great programs teaching the fundamentals of machining, but where these schools fall short is in recruiting high school students to join them. That is mostly because these days no industrial education courses are being taught in high schools—classes that traditionally piqued student’s interests and fed the career pipeline. Koslowski believes that there’s still a future in machining, and that students need to be informed of this—that they don’t necessarily have to go to college to be an administrator, businessperson or information technology professional. In the meantime, Roush’s partnership with local schools and in developing its own training program has been successful. And Koslowski continues to challenge other industry leaders to help find a way to address the skills gap. Join the discussion about skilled labor at www.facebook.com/makinomachine. While the shop handles work for all types of industries, one of the first thoughts that come to mind upon hearing the Roush name is auto racing. Having been a leader in high-performance automotive part production for decades, and with the Roush Fenway Racing team tearing up the Nationwide and Sprint Cup Series, it’s a natural association. Not only is Roush Industries a vital contributor to the success of the Roush Fenway Racing team, but it is also literally at the heart of all Ford Racing NASCAR teams, machining every new Ford Racing engine block. 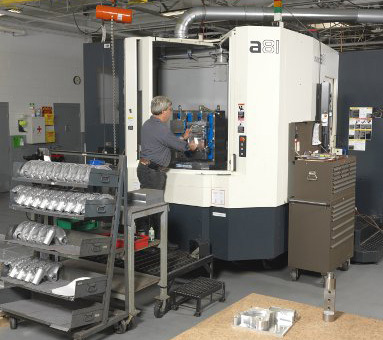 Working together, Roush, Makino and Single Source Technologies (SST) developed a complete processing solution, including tools, fixtures and machine parameters that would enable reliable and repeatable processing on the a81 machines. The company was up and running, cranking out blocks for Ford Racing in a short amount of time. 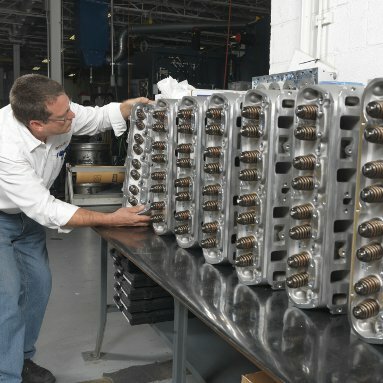 Another automotive part production project that Roush uses the cell to produce is high-performance aluminum cylinder heads. According to Koslowski, this application was made possible only through automation. “In a purely stand-alone environment, these cylinder heads would not be a profitable order to take on due to their extremely small quantities, short lead-times and stringent accuracies. The flexible manufacturing system completely changes this situation, allowing us to pull up orders quickly with very minimal disruption to our overall product flow. Without the MMC cell, we wouldn’t have those orders,” explains Koslowski. 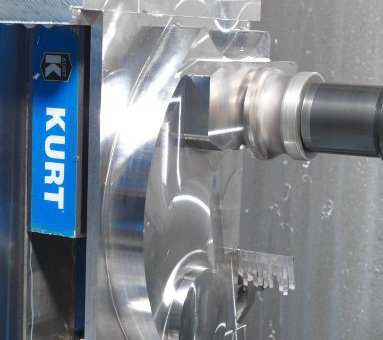 With the rigidity and precision of the a81 horizontal machining centers, Roush is capable of holding extremely close positioning tolerance and tight bore-diameter tolerances, setting a new standard for accuracy. While Roush has enjoyed success in working with clients from a wide range of industries around the world, the leadership at Roush knows that having the right technologies isn’t the only key to success. It’s also the people on the floor who get the work done. Roush Industries’ leadership, initiated by Doug Smith, the COO of the company, approached three local schools with a proposal for establishing a CNC machine training program. This effort would provide Roush employees and any students interested in machine-tool operation with the opportunity to receive vital training that is no longer available in most school curricula. After initial conversations, Roush decided to work with Schoolcraft College to design the courses and implement what is known as the Roush Machinist Training Program. Roush uses the training program as an incentive for new operators, covering all expenses related to the training after an operator has been with the company for one year. This approach ensures that the employee has a solid foundation in the Roush culture and production processes when students enter the program, and it serves as an incentive for them through career advancement once they graduate and bring their new skills back to the shop floor. After all, what good is a high-performance manufacturing system if there’s no operator capable of pushing the technology to its fullest potential? Roush has already seen significant interest in just the first year of the program with one graduate, multiple current students and recent hires who have already been nominated and plan to enter the program when eligible. With this training effort in place, Roush knows it will help the qualified personnel to make what matters well into the future. While best known for its performance racing equipment, Roush has also enjoyed success in working with complex parts from a variety of industries, including crucial components for amusement park rides. Unlike many other production facilities, Roush frequently takes on short-term production contracts with orders that vary from one part to a few hundred, and may arrive as single-run or repeat jobs. With the success Roush has experienced, it must not only ensure the personnel is going to be there to deliver success in the future, but it also has to continue investing in capacity and capability through advanced machine technologies. When recently evaluating additional investments in Makino equipment, the decision was made to turn some office space into shop floor. This will allow room for additional Makino machines in the future. 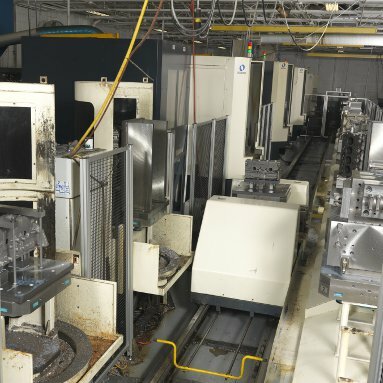 In order to rearrange the layout and expand the company’s automated capabilities, Koslowski and Carney are currently evaluating a number of different workflow arrangements to bring on this additional capacity, including cell integration of the company’s current stand-alone machines and the purchase of a sixth a81. Additionally, the company is considering investments in 5-axis machining capabilities. During a recent open-house event, Koslowski witnessed demonstrations of a Makino D500 5-axis vertical machining center and PS95 vertical machining center. He immediately recognized the impact that it could have working together with the a81 cell. “Ideally, I’d love to integrate 5-axis capabilities into the cell while complementing the cell with stand-alone machines. Both of these machines fit the bill,” Koslowski says. Combining the success that Roush Industries has achieved for decades with its future plans for the Roush Machinist Training Program and additional investments in advanced machine technologies, the shop is well positioned to continue delivering the impossible for its customers.